Dr. Dailey recently joined Spectrum Medical in July 2015. 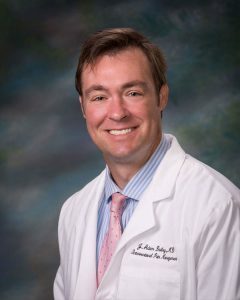 Having been raised in Hillsborough, Dr. Dailey received his Doctorate at the Brody School of Medicine in Greenville, North Carolina. He then went on to attain his residency at Baylor University in Houston, Texas, considered to be one of the of top Physical Medicine and Rehabilitation programs in the country. Dr. Dailey’s hard work both medically and academically allowed him to achieve a fellowship at the renowned pain management department at MD Anderson Cancer Center in Houston, Texas, where he has spent the last four years. With an exceptional reputation for patient care, Dr. Dailey is committed to combining core family values with his experience to provide treatment unique to each individual.